VHBTM Acrylic Foam Tape, holds up to 10 lbs. Wood, metal, brick, concrete. ot recommended for drywall. A simple and effective method of attaching a handrail to a newel post or a newel post to a stringer. An access hole is drilled in the newel post and the bolt is tightened up using this hole. Holes can then be sealed using included plugs. Kit includes a bolt, washer, and 2 plugs (one oak and one maple). Use this Rail-Bolt fastener to attach a handrail to a newel post, a handrail to a handrail, or a handrail to wall. This inconspicuous fastener design doesn't leave any noticeable holes behind. A hole is drilled underneath the handrail to apply and tighten the nut. A plug is then applied to the hole to conceal it. The kit contains a screw, nut, washer, and 2 plugs(one oak and one maple). Command Hooks are available in a wide range of designs to match your individual style and dicor. They also come in a variety of sizes and hold a surprising amount of weight. Command Damage-Free Hanging Hooks hold strongly on a variety of surfaces, including paint, wood, tile and more. When you are ready to remove your Command Hook, it comes off cleanly without damaging surfaces with holes, marks, sticky residue or stains. 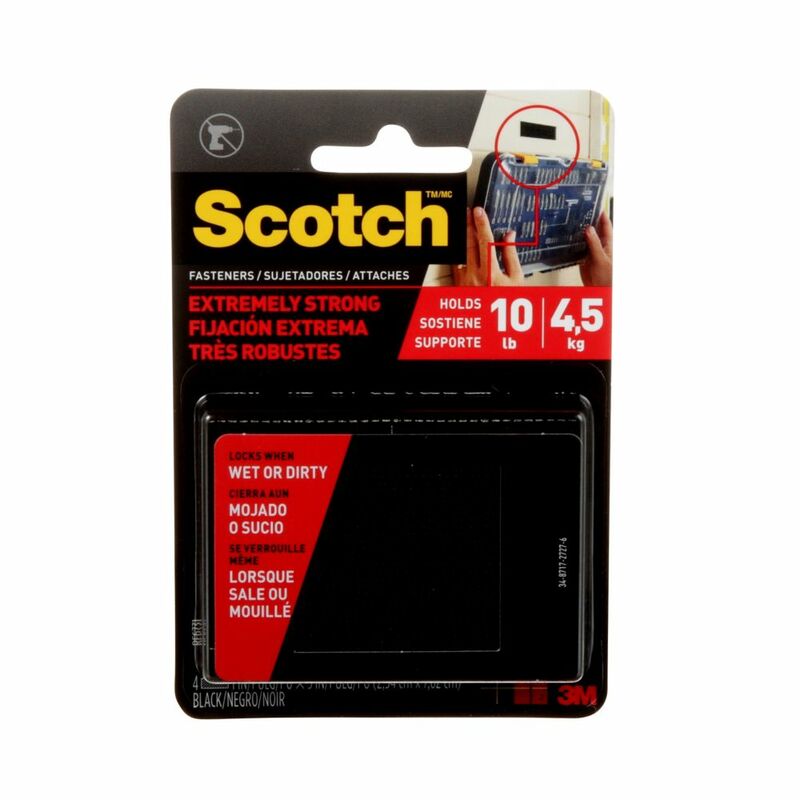 Scotch Indoor Fasteners are the alternative closure to zippers, snaps and hooks. Works on most surfaces that are painted, varnished or sealed surfaces, including drywall, wood, metal or brick. Also great on bare metal, glass, and many plastics. Provides a convenient way to mount objects in the home, office or car. Try mounting a flashlight or remote controls to a wall, furniture or electronic devices. Great for under-cabinet lighting. Holds up to 3 pounds, 1 inch of product holds 1 pound. Contains 1 set of white strips, 3/4 in x 5 ft.
Scotch Extreme Fasteners, 1 Inch x 3 Inch is rated 4.0 out of 5 by 5. Rated 5 out of 5 by Gardener from I stash frequently used pens/markers in an interior pocket of my handbag. These fasteners withsta... I stash frequently used pens/markers in an interior pocket of my handbag. These fasteners withstand constant open/close. Rated 4 out of 5 by Susie Q from Ok I tried these fasteners to hold a small (3 X 2) area rug in place in my entry way. (My dogs moved the rug around every time the mailman came or the wind blew, and I needed a solution.) I used the fasteners on the finished hardwood floors. They just weren't strong enough for that level of dog activity. However, I was able to get them off the floors without damage by using WD40. (I soaked them in it and then used a Scotch Brite sponge on the liner). So, I would not recommend these for my use, but they are probably good for a different use. If you want to remove them, try WD40 (olive oil might work too).